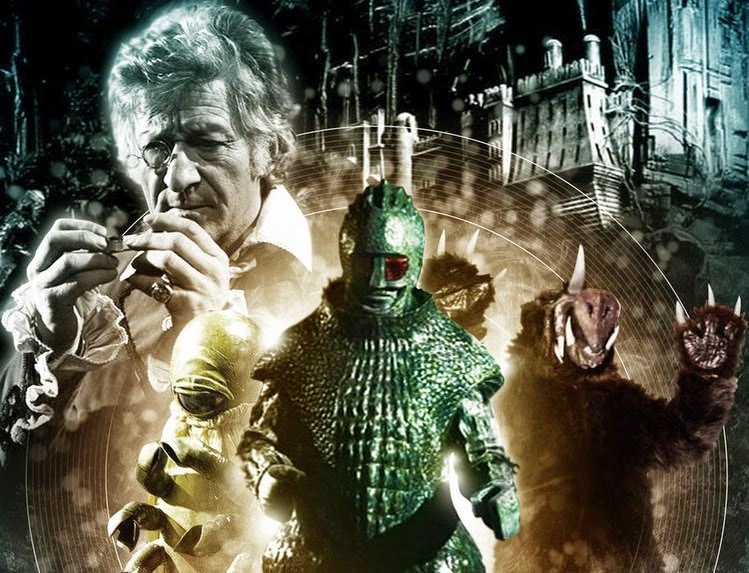 I liked The Curse of Peladon a lot. It was a nice break from the Earth bound stories and featured some good political intrigue and a murder mystery. Plus a random monster that the Doctor hypnotizes using a lullaby. Good stuff. The Doctor has seemingly fixed the TARDIS and he has gone on a test run with Jo. They end up in the future on the planet Peladon, which is thinking about joining the Galactic Federation. The Doctor and Jo pretend to be the delegates from Earth and get swept up in the events going on. I say seemingly fixed the TARDIS because it is revealed at the end that the Time Lords sent the Doctor here to be their low key agent and make sure events went in the right direction. The Doctor’s exile isn’t over yet, but it may be soon. Unless I’m mistaken, this aired around the time the UK was thinking about joining the Common Market, which would eventually become the EU. As such it is a veiled political allegory that shows the planet Peladon torn between staying as they are or joining the Federation and facing an uncertain future. Young King Peladon (who is named after the planet I guess) thinks that joining the Federation will be a good thing and will elevate Peladon and its citizens. His councilor Hepesh is afraid that Peladon will lose its identity and be subsumed in the Federation. Both are good points, though the story clearly sides with Peladon since Hepesh is a murderer and attempts a coup. What I found interesting is watching it now with Brexit happening and viewing it through a more modern context. Hepesh would have sided with the Leave contingent (not that I’m saying the Leave contingent are murderers, mind) since a lot of his arguments against joining are the same arguments made for leaving the EU. The story does a good job of giving everyone shades of grey and moral ambiguity. Here the Ice Warriors aren’t the evil villains that they have been depicted to be. They are reasonable beings. It is the Doctor who lets old prejudices blind him to what is truly going on. Jo shines here, thinking on her feet and coming up with some good lies to keep the Doctor and her safe. She does a lot of the investigating to discover what is really going on in the poorly lit castle. She clearly has affection for King Peladon but she never truly leads him on, knowing that she can’t stay. Instead she tries to make him a better king in the short time they have together. The Doctor is still the hero, mind, but he does seem to take a secondary role at times. Still, he is the one who figures out the truth behind Aggedor and uses the beast against Hepesh and his soldiers. The Federation ambassadors are better characters than I would have originally thought. I wouldn’t want to see a spin-off with them but they each had their own motivations and were easy to tell apart (aside from the obvious alien appearances of each). My only complaint is that I felt at times the story dragged a little and maybe there were a few too many scenes of people wandering the secret corridors of Castle Peladon. Still, I can’t praise this story enough. It showed that Doctor Who can do a time and space travel adventure on a low budget and make it work. Edited by Virgil Vox, 24 March 2019 - 12:18 PM. This was a good one, a nice exercise in worldbuilding. I wish we'd seen more of the future era in which it was set, more of its somewhat Trek-like multispecies Federation. Brian Hayles's choice to redeem his creations the Ice Warriors, to show that entire alien species don't have to be uniformly villainous, was an intriguing and effective choice, and I would've liked to see more of them too. And yes, it's a good Jo story too. I loved her fearlessness in rushing in to "save" the Doctor from Aggedor. Who needs a TARDIS when history always repeats itself?